The 94th American Legion National Convention color guard and concert band contests Aug. 24-25 will feature post-sponsored groups from across the country competing for national bragging rights. A day later, the groups will uniform up for the national convention parade, marching through Indianapolis and hoisting U.S. flags. Bob Zinko would like to hear from anyone in possession of Legion drum and bugle corps memorabilia. These two familiar contests are what remains of the Legion’s famed drum and bugle corps competititions, which in their day were the grandest in the country. Early Legionnaires commonly formed drum and bugle corps to express their patriotism and stay connected after discharge from service. Hundreds of Legion groups marched and performed in communities throughout the nation and competed against each other in local and state contests, dreaming of bringing home a national championship someday. As time passed, and creativity gained an equal footing with precision, Legion participation in drum-and-bugle competition dwindled. But high schools, colleges and independent corps kept it going, adding their own flare to an activity rooted in Legion tradition. Such an activity was natural for veterans. Musical instruments were battlefield staples long before the American Revolution. They were used for everything from giving direction to providing a marching beat. Over time, field music became a greater part of military life, and in seeking to keep their camaraderie alive after service, veterans made a place for it within their postwar organizations. The Legion’s first national drum and bugle corps championship was during the Third National Convention, in Kansas City in 1921. The number of competitors was small until 1930, when the championship came to Boston and entries poured in. Delegates were inspired by pioneers like the Boys of ’76 from Post 76 in Racine, Wis. – originally formed by a Wisconsin National Guard battery before World War I. These early corps were known as “senior” drum corps, consisting of older adults. 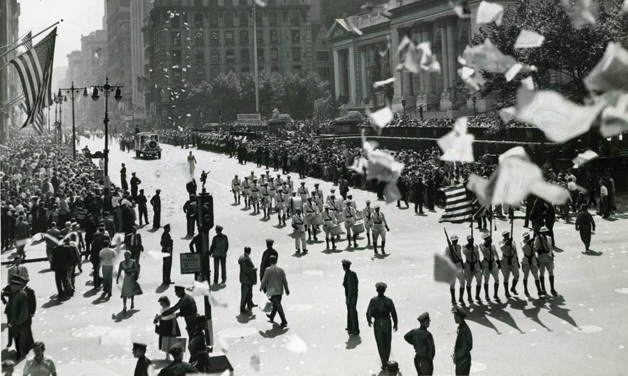 The 1937 championship in New York debuted a division for “junior” drum corps, made up of Sons of The American Legion members. The Legion Auxiliary also formed corps of its own. The national convention competition grew to become the largest of all drum and bugle corps events. The first generation of competitors, World War I veterans, insisted on utilitarian, military-style performances. Young people who wanted to be more creative had few options to effect change. That divide continued into the 1950s, when national contests and new corps were formed that had neither veteran sponsorship nor influence. The Legion adapted to some extent, placing more emphasis on field performance than parades. Still, the changes weren’t enough, and in 1971, a number of corps directors met in Indianapolis to form an organization of their own that would welcome more creativity. That shift only added to the struggles faced by the Legion championship as college and high-school marching bands grew in numbers and performed during the same seasons, and competitions became more expensive. In 1973, the field routine was eliminated, and in 1980, The American Legion got out of drum and bugle corps competition altogether, conducting its final championship in Boston that year. After a one-year break, the convention welcomed back the two more focused competitions: the color guard contest, which started in 1937, and the band contest, started in 1927. Most post-sponsored drum and bugle corps have disappeared since then, but Bob Zinko remembers them well. A Connecticut native and Legionnaire, he grew up in the 1950s and 1960s, joining the Bridgeport Scarlet Knights for a year before turning to sports. His enthusiasm for drum and bugle corps performances, though, has remained strong. He even started collecting corps memorabilia. Zinko began visiting American Legion National Headquarters in the 1970s, and over time he was granted access to files on the Legion’s many post-sponsored drum and bugle corps. Due to the program’s age, inactivity and a seeming lack of interest, the library handed over the materials. Retired now and living in South Carolina, he spends most of his spare time visiting posts across the country to chronicle their drum and bugle corps history. He’s obtained information on nearly every corps that existed. Some of the shows Zinko attends are sponsored by Drum Corps Associates (DCA), the governing body for senior or all-age drum and bugle corps, and co-founded by the late Almo “Doc” Sebastianelli of Pennsylvania, a World War II veteran and past national vice commander of the Legion. Though he never played a musical instrument, Sebastianelli loved drum corps and supported the Legion’s national championship for decades. “He always just thought that it was a good thing that the Legion had, a healthy American kind of thing,” says Paula Puchalski, Sebastianelli’s daughter. Sebastianelli’s love for the drum and bugle corps culture wasn’t limited to the Legion, where he served as a convention color guard competition judge as late as 2008. He loved the corps for what it did, not who organized the competitions. That’s why, in 1963, he called a meeting in Scranton, Pa., that founded DCA. He saw that the deep differences between Legion leadership and the new-school drum and bugle corps likely could not be resolved, and he wanted to ensure that the activity survived. Thus, even after the Legion bowed out, Legion senior drum corps still had an opportunity to perform and compete. Puchalski says her father insisted on the display of the U.S. flag at all times in DCA competition (as corps became more independent and artistic, the colors had less of a role). And he succeeded in getting a resolution passed by the National Executive Committee that allowed him to resurrect a Legion tradition in DCA: every year since 1997, the national champion has received a special orange flag to display for the year. DCA’s counterpart, Drum Corps International (DCI), sprang from the 1971 meeting of corps directors in Indianapolis. Today, it boasts more than 5,000 young people from across the United States and several foreign countries in its World Class division, and puts on a yearly Drum Corps International Tour that draws nearly 400,000. Combined attendance at the championships averages nearly 60,000. Dean Acheson, DCI’s executive director and CEO, says the DCI’s Legion roots are still visible amid the colorful flags and gyrating brass players. At the August 2011 championship semifinals at Lucas Oil Stadium in Indianapolis, corps marched in and out to the beat of a drum, in order. The kids “know to have respect, and not break ranks” while in competition, he says. And though displaying the colors isn’t required in the semifinals, every team participating in the championship finals takes the field with the U.S. flag. Zinko also sees the Legion’s past within the vibrant present of DCI and plans to set up exhibits at the World Championships to tell that story. The U.S. military values today’s crop of drum and bugle corps competitors as potential recruits. At the DCI semifinals, U.S. Army and Marine Corps musicians staffed booths, looking for a few good men and women. Gunnery Sgt. Jason Knuckles, who has played the saxophone in Marine bands for 16 years, says many USMC performers are former DCI competitors. His display at the competition included the ever-popular chin-up bar. On the day of the 2011 finals, the semifinalist corps that did not advance to the finals participated in DCI’s first-ever “Celebrate Indy Arts!” parade. Most carried U.S. flags along with their banners and other colors. Some played selections from their competitive sets, while others offered more traditional marching music. The parade ended at the American Legion Mall, where about 2,000 brass players conducted by Maj. Brian Dix – director and commanding officer of the U.S. Marine Drum and Bugle Corps – played “Battle Hymn of the Republic,” as drummers and color guards stood at attention. “These people love their country,” Acheson says. Dave Priester, chief judge of the Legion’s national contests, has participated since 1991. He has no performance experience but has been judging for approximately 35 years. He acknowledges that the number of participating bands and color guards is down and blames that on several factors: the economy, distance to convention sites, and the fact that some band or color guard members have been called to military service. Priester and his colleagues, including members of the Legion’s Convention & Meetings Division, are working to increase participation and plan to publish a multimedia handbook for color guards looking to get started, including online videos and podcasts. As for reviving The American Legion drum and bugle corps competitions to their former state of prominence, Zinko says it’s a tough sell. Few posts have much experience anymore, and the competition season still nearly conflicts; the DCI World Championships are in mid-August, two weeks or fewer before the national convention. Perhaps it is fitting that the Legion’s emphasis has been refined to music, respect for the U.S. flag and one grand parade performance in front of the entire Legion family. While other organizations experiment with modern music and back-flipping flaggers – the things that make them great – the Legion contests focus on order, respect, remembrance and tradition – some of the things that make it great. Laura Edwards is associate editor for The American Legion Magazine.